Oh BABY!!!!!!! 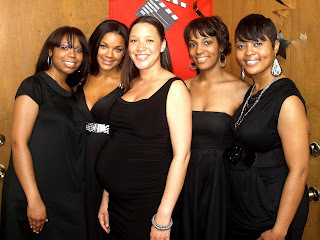 : BABY SHOWER PICS!!!! So last night Paul went through and edited the pictures that were taken for at the baby shower. I have been waiting what seems like FOREVER to be able to see them and once again he did NOT disappoint. They pictures definitely captured the spirit of the event and how much fun everyone had. The above picture includes my best friends (all who came in town from Minnesota, Washington DC, Alabama and Memphis) who pulled this event off. Words can not express how thankful I am to have such caring friends in my life. I am truely blessed when it comes to the friends that I have made over the years. Anywhoo...you can go to Noah's blog (click here) to see all of the pictures because it would just take TOO long for me to upload them to this post...lol. 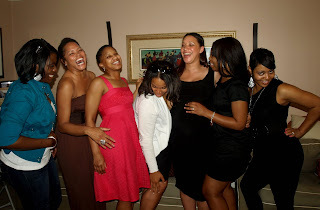 Oh and below is one of my favorite pictures from that day....of me and my HILARIOUS Sorors that were present. On another note...yesterday marked 35 weeks for us and we are rounding 3rd base on our way home!!!! I am tired of being in bed the majority of the time, but I know that next Thursday will be my LAST day having to do this...lol. My mom came and busted me out of jail yesterday and drove me around to take care of a few things that were on my to do list. I was SO happy she was able to do this. She also took me to my doctor appointment. When we first got there they took my BP and it was pretty high (150/90)...and my BP has NEVER been high. During the appointment the Nurse Practitioner was concerned about it so she took it again just to be sure....and it was still a little high but low enough for her to let me go home rather than checking me into the hospital. They drew some blood to make sure nothing was going on to be concerned about and when I called today to check they said everything looked fine. So maybe all of the activity from that day (since I had not been out the house other than to go to the doctor in over a week) made my BP elevate a little. So next Thursday I will come off of this medication that they have me on and HOPE that I go into labor within a week or two!!! YAY!!!! I will be a walking and organizing fool in anticipation!!! !